We examine the Market on a Broad Scale, looking at macro events, such as earnings, Fed announcements, economic reports, current events that might affect the market, stock buybacks, product announcements, etc. We also examine Industry Groups affected by the broad market and use Technical Analysis to find live actionable trading ideas. On the Global Front, we watch all the important news, tracking (for example) the Oil situation, the impact of China’s economic events on our markets, potential interest hikes from Fed, and other news. We don’t want anyone to get the idea that the Lab is just for Real Time traders. We fire up our EOD component towards the end of the day – vigorously discussing new positions, and the management of existing trades. We also review Earnings candidates and patterns that may be setting up in the charts. We often create and share Custom Trade Plans and Scans. Any time we find an idea that we think will benefit our users, we share it. 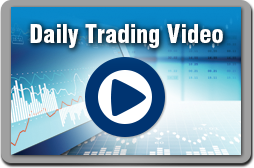 Our Daily End-of-Day Videos last about 15 minutes, and include Trades that will be taken the next day. We also evaluate signals that were found from our End-of-Day prospecting. Our Weekly Recap is also a feature video and bullet-point document that covers all the major events of the week. 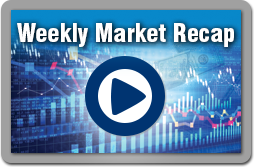 In the Weekly Recap, we plot levels on major moving stocks, as well as levels on the indexes for next week’s action. Each Recap is oriented around education and coaching – how we identified ideal setups using the software and other assets, empowering our users with this knowledge. 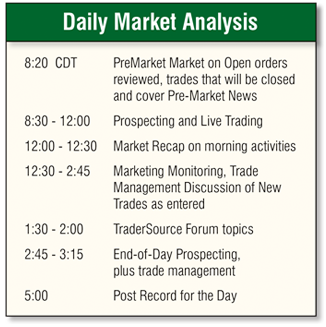 Every week our experts will show you how to use the trading tools in the current market. Follow along with our VisualTrader Trading Team as they look at hot prospects across the market. Click on the video to the right to see which stocks and ETF's they think have the highest profit potential. Every Friday, our VisualTrader Trading Team looks at what happened in the market and discusses what to expect in the coming week. 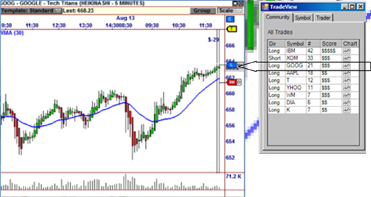 Here is one of the recent trades we executed, using Volume Weighted at Price (VWAP) from the Profit Bands Plug-In. 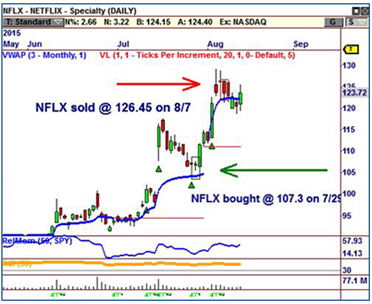 In this case, Netflix approached the VWAP line and hesitated. This is a prime opportunity point. An entry here resulted in a 20% profit in less than a week. As we see opportunities like this, we always explain precisely which technical method we are using to confirm the trade. 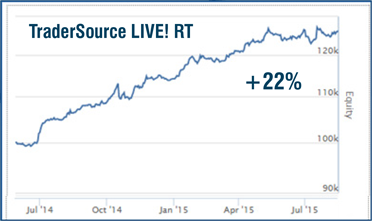 To the left is our Real Time Performance graph, including all trades taken over about a year. The simulated account was up about 22%, compared to only 4% for the general market. We strive to make money in TSL. But our broader mission includes explaining how to use the software to empower our users to engage the market, and to highlight good trade ideas that are brought to our attention by the Community. With TradeVIEW, the TSL team discusses new trades entered by the community using the higher scoring opportunities, offering our own insights on each new opportunity.